pre-occupied this weekend. We were planning on the family trip to see the in-laws in London but turns out Neo has come down with a nasty tummy bug..
Thankfully the lovely Jessi offered to guest post for me, she’s gorgeous and has amazing style. Go check her blog for more, but for now, here’s a little taster of that fabulousness. Hello, friends! This is Jessi from Haircut and General Attitude! I’m so so honored to be guest posting for Rachel today! I love her super cute style! We have pretty similar taste. 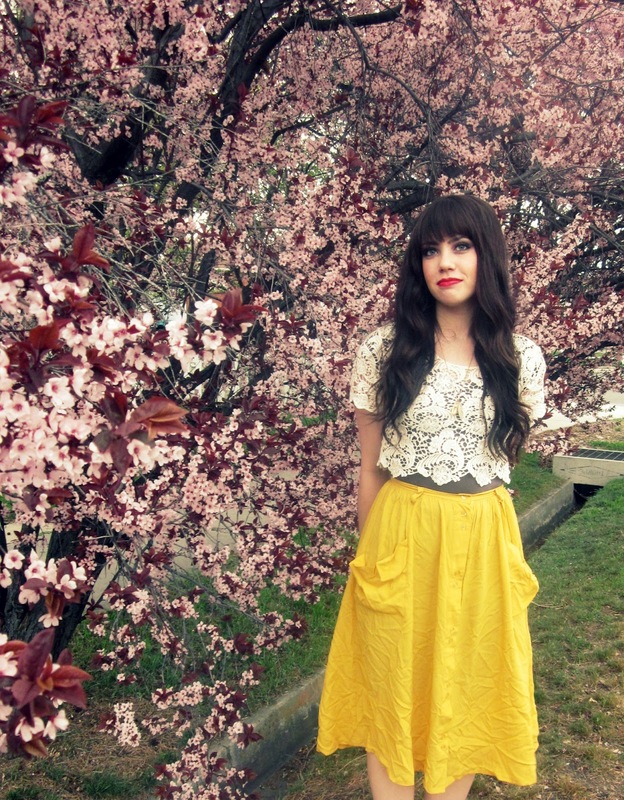 I love all things vintage and girly so her blog was a quick favorite for me. Where I live the weather has been sunny and happy lately! Spring is definitely here and we have beautiful trees blossoming all around! Perfect for pretty photos! I had my cute hubby snap these on a nearby street in our neighborhood. He was more embarrassed than me at the cars driving by…haha. 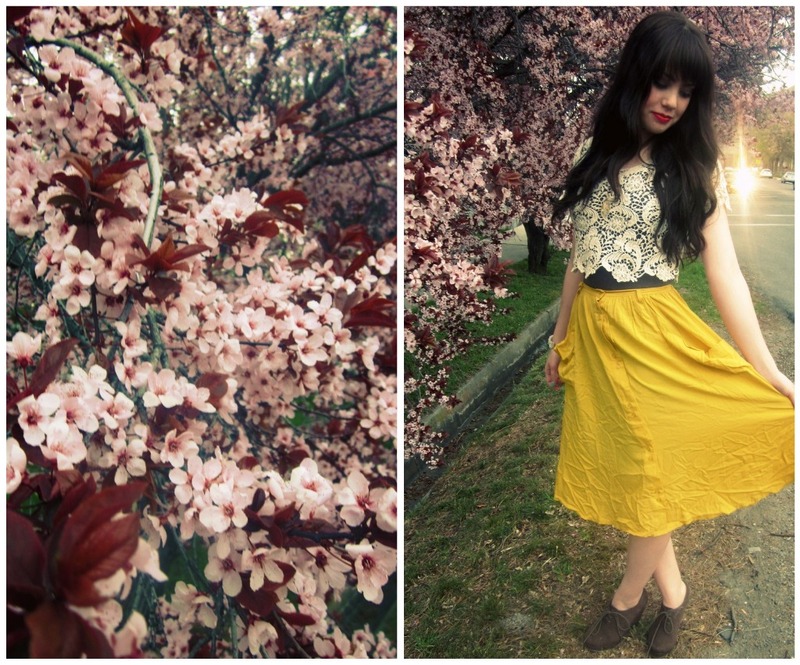 I’m wearing some of my current favorite things (obsessions), lace, long skirts, mustard and wedges. I also want to brag a little that I made the bracelet I’m wearing. Maybe some of you are excessively crafty but it’s quite the accomplishment for me! Is everyone excited for Easter weekend? I know I am! I hope the weather stays so warm and gorgeous! I’ll be headed to the mall Saturday for an afternoon of shopping and Sunday will be spent coloring eggs with the hubby and having dinner with my family. Hope everyone has an awesome weekend! And thank you Rachel for the wonderful opportunity! Happy Easter to you all, hope you have amazing weekends and i will be back soon! Beautiful outfit, that top is stunning. And I adore your hair. 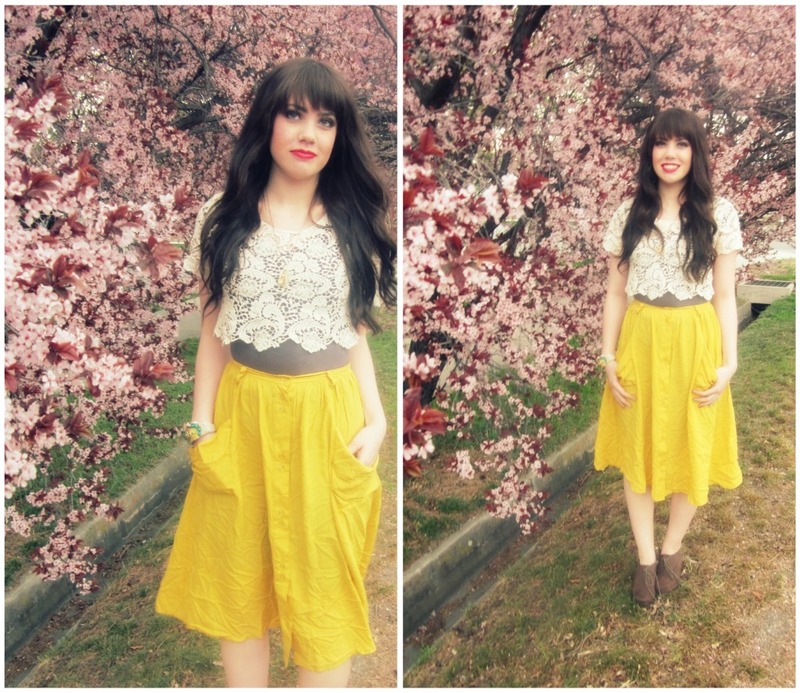 Lovely post, beautiful outfit. Your neighbourhood looks so pretty!